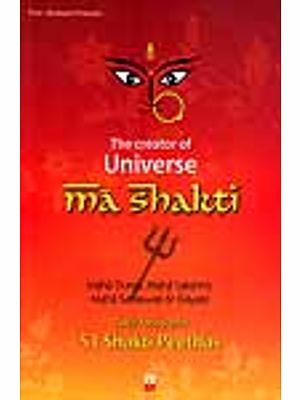 This book containing choice prayers from select hymns presents to the devotee just a little cream of devotion from the mighty milk ocean of Sanskrit religious literature. The lines are free from sectarian bias and speak of the universal aspect of the Deity common to all religions and creeds. As such, they are sure to appeal to all seekers after Truth who follow the path of devotion in some form or other and want passages for meditation praise and prayer all together. Sound and thought are inseparably connected the former being an expression or vehicle of the latter. The spiritual aspirant takes the help of the sound symbol with a view to awaken the holy thought in his mind. On rising to the mental plane he may do away with the sound symbol altogether. And if he is able to ascend to the heights of realisation and lose himself in divine communion, he dispenses with the mental wor- ship even. But until the divine vision dawns on him, he has to seek the help of symbols- material, verbal or mental-which may be taken up either singly or jointly. "Material worship (or the use of an image as symbol-ising the ideal)," say the Hindu scriptures, " is the first step; then comes the repetition of the Lord's name and the singing of His praise; the next Course is mental worship or meditation; and the final stage is the realisation of the One without a second." Thus man comes to take up higher and higher forms of spiritual practice in his march towards the highest illumination. And in this matter hymns and prayers have ever formed an important aid. spoken of as the god who regulates the course of the sun, and is intimately associated with Varuna who dwells in the bright blue sky, who is merciful to the penitent and releases them from sin. Agni is the god in the fire, 'an immortal who has taken up his abode among mortals', the deity through whom all other gods receive oblations and worship. He is often described as the father (Universal Prayers, No. 12) and also as bro- there, kinsman and friend. Push an was the deity representing the beneficent power 'of the sun and the giver of prosperity and protection (Universal Prayers, No. 13). Savita was also the solar deity who stimulated life and activity in the world (invoked in the well-known Gayatri Mantra-Universal Prayers, No. 14.) There are many other names of gods occurring in the Vedic hymns. And it is a very striking fact that at the very dawn of man's spiritual consciousness the Vedic seers, while they prayed mostly for their material welfare and happiness, could recognise the existence of an indwelling Spirit at the back of each natural phenomenon, and some of them went so far as to realise the one God at the back of the many gods. Behind the apparently polytheistic conceptions there is almost everywhere a deeply engrained monotheism that is clearly expressed as each god is invoked and worshipped as omnipotent, omniscient and even omnipresent. Indeed, many of these seers, especially the most advanced ones, worshipped the one and the same divine Being in His various manifestations. This is made clear in the famous Rig Vedic hymn (I, I 64, 46) in which the Rishi, in his praise of Surya-the most concrete of the solar gods- goes so far as to declare: "They call Him Indra, Mitra, Varuna and Agni. The Being is one, but sages call Him variously:' And this wonderful current of applied mono- theism has been flowing on in the hearts of the Hindu devotees with unabated, 'nay, increasing strength up to the present day.